If a certain color deck light or post cap is not available in your post size, then maybe a conversion base is your answer. 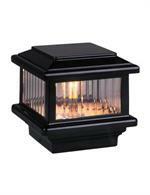 These bases allow a deck light or matching deck light post cap to mount to a specific size post. They are available in many different sizes and colors.